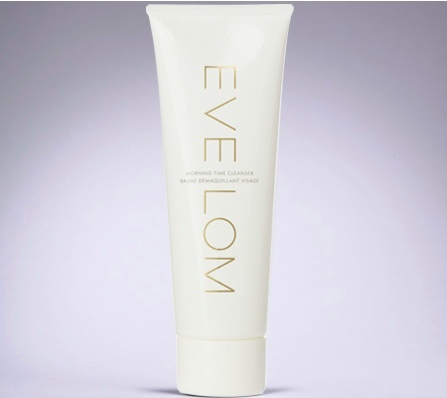 The original Eve Lom cleanser has gained itself cult status within the beauty world for being the ‘do all’ product. The concept behind the Eve Lom cleanser is that it is the only product you need to use. Even though there is a small range of additional products in theory with the cleanser there should be no need for a plethora of different creams and cleansers. You may be thinking why is there an additional/different cleanser if the original is so good? Well we asked ourselves the same question and set out to give the new one a try. We found many noticeable differences between the two products, with the latest cleanser differing from the original first and foremost because of the absence of the muslin cloth which is used to apply and remove the original cleanser. The Morning Time Cleanser is also billed as being quick and easy to use and it is indeed a quicker and less laborious process than the original with application simply involving warming a small amount of cleanser between hands before massaging it in circular motions into dry skin. Leave for two minutes and then rinse off using water. This product is fantastic, it leaves the skin soft, youthful and radiant and its formulation of natural exfoliant papaya and collagen boosting carrot oils make it a great product to wake you up in the morning. Eve Lom have suggested using this product in the morning followed by the original cleanser in the evening but Morning Time works perfectly as well when used for both. If you would like to purchase Eve Lom’s Morning Time Cleaner £35 you can do so from the official website. Festival survival kit Whats on everyone's lips?